“I was kindly invited to attend the government’s launch of a new initiative to put mental health on a par with physical health within the NHS. The event itself was very worthwhile and interesting. The conference kicked off with an outline of the government’s action plan, given to us by Nick Clegg. The aim is to raise respect and awareness for mental health. This takes shape in many different forms; from ditching the stigma attached to mental health to giving patients more specific waiting times. It was very encouraging to see the amount of support this initiative is receiving. We were very privileged to get a private audience with the Liberal Democrat Minister of State for Care and Support, Norman Lamb. We were encouraged to ask anything we liked and Mr Lamb answered to the best of his ability and was very honest and genuine. 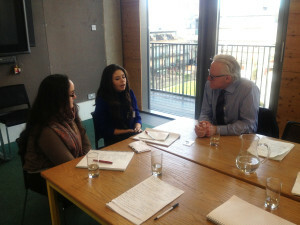 I was very impressed with the way Norman Lamb came across – he is truly passionate about the mental health sector and it is very encouraging to know that he is backing this initiative. “At this conference, Nick Clegg outlined 25 areas within the mental health sector that the government wants to improve. Nick Clegg’s address was very encouraging and, having experienced the mental health system myself, I felt that he was targeting some really worthwhile areas for improvement. Throughout his speech, the deputy prime minister quoted a number of shocking statistics. One that stood out particularly was that while one in four people suffer from mental illness, only one in four receives any kind of treatment. I found this truly appalling and was relieved to hear that the government aim to increase the availability of treatment. Following the conference, we had the honour of a private meeting with Norman Lamb, the Minister of State at the Department of Health. In the meeting we had the opportunity to raise any points of concerns we have, regarding mental health services, and then discuss the government’s plans that had been highlighted in the conference. It was a delight to find that Mr Lamb was genuinely passionate about making a positive difference to a service that is so desperately needed by so many.